It’s never fun seeing something wrong with your kitty, and then taking them to the veterinary hospital only to find out that you could’ve easily prevented the problem at home with no cost. Of course, the peace of mind from a veterinarian is good to have (better to be safe than sorry when it comes to pets), but ultimately the ideal situation is one where your animals are happy and healthy. 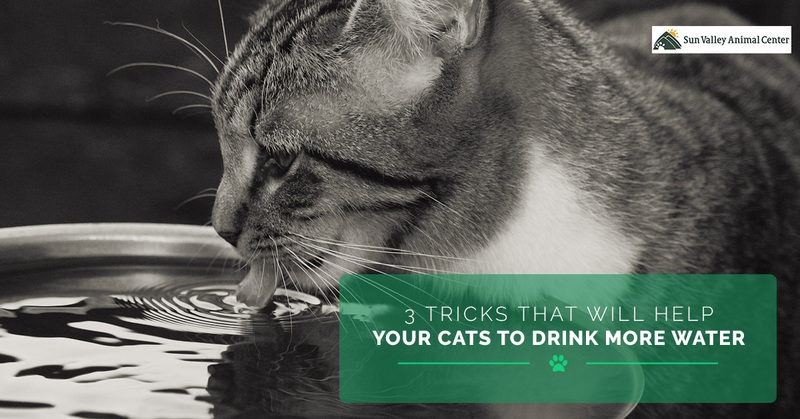 When it comes to cats, they’re often not drinking enough water, even when they have a full bowl readily accessible. There are a few reasons for this, and there are easy tricks you can do that will get them to start drinking more! Dehydration is a serious condition that can lead to a slew of other problems. By making simple tweaks to their living situation, you can help to prevent this. Do you have a cat that’s desperate to drink out of every cup you put down, despite having a giant bowl of nice clean water? The fix might be much more straightforward than you’d think—the cat’s water might be too close to its food. It’s been observed that cats tend to drink more from a bowl that’s separate from their food. Experts have speculated reasons for this; the prevailing theory is that cats instinctually don’t like to drink water next to food, because in the wild, it could be contaminated by their kill. Obviously that’s not the case in your home, but you can’t fight against instinct. Moving the water bowl might send a message to the cat that the water is safer to drink. You don’t need a doctor to tell you that you’d rather drink a fresh cup of water instead of one that’s been sitting out for three days. Similarly, you don’t need a veterinary hospital to tell you that your cat probably feels the same way. Cats are picky about their water, and even though they’ll drink what’s there if they have to, you can bet that they’d rather drink from a fresh source. Scents, contaminants, and debris can find their way into an old water bowl, which might deter the cat from drinking there if they don’t have to. Did you know that most cats love drinking from a running water source? Studies have shown that, when given a choice, kitties much prefer a moving water source rather than a stagnant one. There are exceptions, but this is generally true for most cats. There are a couple of theories for this; going back to our first point, running water has a lesser chance of being contaminated in the wild. It’s also more fresh when it’s always being cycled. Whatever the reason is, most cats love running water, and you should try setting it for them if you can. Cat fountains are affordable and found at most pet shops. Why not give one a try? At Sun Valley Veterinary Hospital, your pet’s health is our biggest concern and top priority. We hope these tips will help you to keep your cat hydrated, which could prevent more serious conditions in the future! And of course, if you’re in the Boise, Salt Lake, Spokane, Billings, or Sun Valley areas, feel free to stop by or contact us for all of your pet’s health needs! We’re happy to help your buddy be as healthy as they can be.